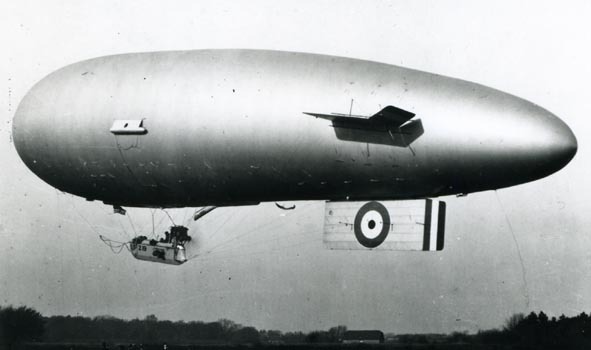 Many persons in Sussex, and particularly those who reside close to the seaboard, may know of the small airships, which day after day, in summer and in winter, during the latter years of the war (1914-18), sailed majestically over the countryside and above the submarine-infested English Channel. These graceful aerial craft operated from the now vanished Polegate aerodrome. That airship station was an important part of Sussex during the war and many of her officers and ratings were Sussex men. Outstanding in the memories of those who served in the Royal Naval Air Service at Polegate, is the terrible disaster in Sussex of December 22nd, 1917, during the war, and was the result of sheer bad luck which resulted in loss of life, injuries to several men, and the destruction by fire of two airships of the "S.S.Z." class. This calamity occurred at night on the snow-covered Downs near Jevington. It was the dramatic climax to a period of considerable trial during hours of thick fog which blotted out visibility on land and sea and in the air. With ghastly swiftness grim tragedy was enacted before the eyes of a little group of men who stood close to two moored airships. It was a horror for which they were not prepared, but they were quick to action and lived up to the high traditions of the R.N.A.S. by the performance of gallant deeds. Two Albert Medals in gold and one in bronze were subsequently awarded. SSZ.19 leaving the RNAS airship station at Polegate. Een volledig artikel is te lezen in het 'Britain at War' magazine.